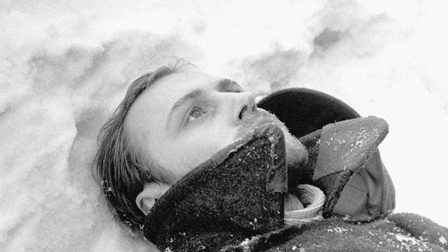 (As Snowmageddon approaches the Northeast, I started thinking about the snowiest films of all-time. Hey, sometimes I go for the obvious. When I think of snow in movies, I always think of “The Shining” but then I had a vivid memory of the battle sequence, described below, in Larisa Shepitko's “The Ascent.” Thanks in part to this Eclipse release, Shepitko's films may be a bit better known today than they were back in 2008, but it's safe to say she still remains criminally underseen by many viewers. You may not have heard of Larisa Shepitko. Though she was a contemporary of Andrei Tarkovsky and Sergei Parajanov, among others, her films have rarely played outside of the Soviet Union. In part, this is due to the fact that she died in a car accident at the age of 41 with only four feature films to her name as well as a few shorts and a television comedy. Filmmakers like Shepitko exist internationally only in the form of retrospectives at repertory theaters, and it is difficult to make a retrospective out of four films. “Wings” (1966, 85 min., not to be confused with the silent American film that won the first Best Picture award) is her first post-graduate feature, and it is a marvelously astute character study. Nadezhda Petrukhina (Maya Bulgakova) was an ace jet pilot during the war but as she reaches her forties she struggles to find a sense of purpose in life. She believes strongly in her obligation to serve her country and fellow citizens, but she finds her job as a schoolteacher unsatisfying. It’s not that she isn’t devoted to her charges; she’s so passionate and dedicated that she steps in at the last minute to play a Viatka doll in a stage play. But like an ex-athlete who struggles to adjust to life out of the limelight, Nadezhda can’t make the transition from war to peacetime. What’s the use of being a war hero if you’re a forgotten war hero? She spends much of the film wandering around town, catching up with old friends or spending time with her daughter Tanya (Zhanna Bolotva) who no longer has time for her. This is yet another challenge for the ex-pilot, adjusting from an identity as a mother to an empty-nester. Her daughter no longer needs her, her military skills are no longer in demand, and she is a single woman approaching middle age. She has slipped through the cracks of Soviet society and tries desperately to gain some purchase on solid ground whether through work or possibly even marriage. Bulgakova, then only 33, inhabits the role of the restless ex-soldier with an understated ease that generates tremendous empathy without histrionics or even an Oscar-worthy crying jag. Nadezhda is a bundle of insecurity who can hide her anxiety in comfortable settings, but roars like a bull in a china shop when on unfamiliar ground. For a war hero, she’s quite vulnerable and Bulgakova isn’t afraid to risk embarrassment in a few scenes, particularly when Nadezhda finally meets Tonya’s husband. “The Ascent” (1977, 109 min.) was Shepitko’s final film. Made a decade later, it displays the same unhurried pace and lyrical tone of “Wings” but in the service of more visceral subject matter. Adapted from a novel by Vasil Bykov, the film follows two Byelorussian soldiers on a doomed mission to find help for their beleaguered unit as they try to evade the occupying Nazi force. Cursed from the outset, Sotnikov (Boris Plotnikov) and Rybak (Vladimir Gostyukhin) come to terms with their fate in very different ways. 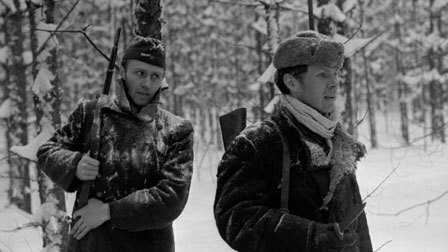 The first half of “The Ascent” is nothing short of brilliant, both as a war film and as a snow film. The snow is everywhere, not just in the trees and on the ground and on the lakes and falling from the sky, but in the soldier’s clothing, encrusting their faces, infiltrating their lungs as they struggle for raspy painful breaths. The list of films in which snow has been employed to equal or greater effect is a short one: “McCabe and Mrs. Miller,” “The Shining” and...? In an amazing sequence that proves beyond any shadow of a doubt that Shepitko was a virtuoso filmmaker, the two soldiers stand off against a company of Nazis. The enemy is barely visible through the driving snow. Sotnikov, shot and barely able to move, fires into the whiteness. Has he hit somebody? There’s no way to tell. For a moment it appears to be over, but then a return volley rings out. He fires again at a barely visible silhouette, ready to die rather than be captured by the Huns. Rybak, not nearly as eager to achieve martyrdom, begins to flee through the woods but returns to drag his crippled friend away from the fight. 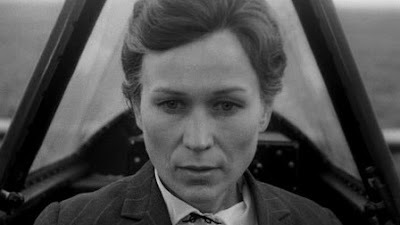 There are other inspired moments in the film, particularly a scene when the soldiers hideout in a farmhouse, a cliché of “soldier on the run” films that Shepitko stands right on its hand, or perhaps she simply brings a more pragmatic, less gung-ho American perspective to the material. Unfortunately, the second half of the movie doesn’t quite match up to the inspired brilliance of the first. Not that it’s bad, but the film begins to feel rather predictable and overly familiar in its later stages. Tragedy has been inevitable from the start, but it unfolds in a mechanical and self-conscious manner that leeches it of some of its potency. Regardless, “The Ascent” is a success by any standard, and netted Shepitko the Golden Bear at the 1977 Berlin Film Festival. Both films are splendid examples of a gifted filmmaker whose work has fallen unfairly into obscurity. The same fate has befallen hundreds of directors, of course, but it seems particularly unjust considering Shepitko’s tragic demise, leaving so few films behind and so much promise unfulfilled. Both films are presented in a 1.33:1 aspect ratio, and both were filmed n in black and white. Both transfers are picture-boxed meaning some viewers will see black bars on the left and right of the screen. These aren’t fully restored transfers like the regular Criterion line. The whole point of the Eclipse series is simply to get as many lesser-seen films out on the market as possible, quickly and in an affordable format. “Wings” shows its share of wear and tear, but is still more than presentable. “The Ascent” actually looks quite strong for an unrestored transfer, and I have no substantive complaints about it. Black-and-white contrast on “The Ascent” is particularly sharp which is a good thing considering how washed-out some of the snowy scenes might have looked otherwise. The films are presented in Dolby Digital Mono. Optional English subtitles support the Russian audio. Like all Eclipse releases from Criterion, there are no extras although the inside sleeve of each DVD features very informative essay about Shepitko and each film. Each DVD is stores in its own keep case. The two keep cases are housed in a slim cardboard slip cover. Both “Wings” and “The Ascent” achieve greatness at times, and even their weak points are stronger than most films. Larisa Shepitko’s films deserve to be seen by a wider audience, and this set from Eclipse provides Region 1 viewers the opportunity to see her best work. I love the Eclipse series. What a great idea and a great service to the cinephile community.